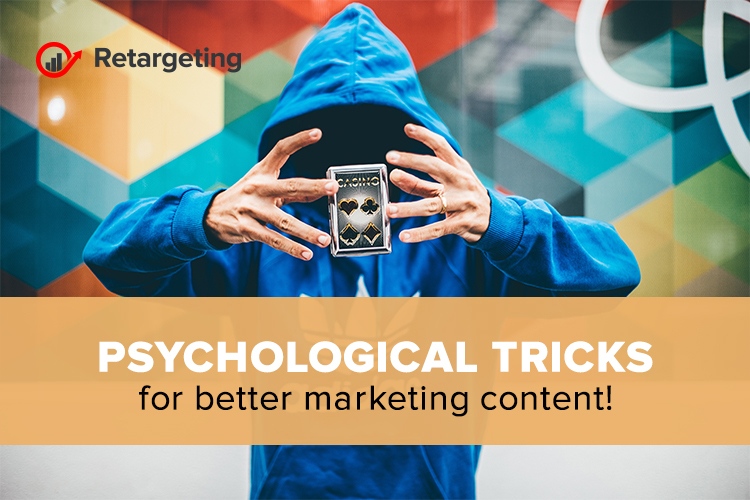 Psychological tricks for better marketing content! Psychological tricks are helpful whether you’re building a website, composing a tweet, or writing a blog post. Psychology indicates what colors are most likely to draw the attention of prospects or how long someone is likely to maintain interest in your message. The more you know about how their mind works, the more you can make informed decisions. These psychological insights can improve the user experience and help keep prospects long enough to convert. The challenge lies in translating often complex psychological concepts into actionable steps that can drive real-world decisions. Here are some examples to help you create more effective marketing campaigns. The number of micro decisions made throughout our day is staggering. A 2012 study showed that visitors judge a website faster than the blink of an eye, in 0.05 seconds. While a 2013 study noted people’s attention span has narrowed to eight seconds at the max. As a result, humans prefer to consume simplistic content and unconsciously avoid information that appears complicated. This is cognitive fluency. That’s why people love emojis, they communicate emotion in a simple, extremely fast way. This goes for everything, the easier is to understand, the more likely it is to hook your audience and keep them engaged. – use emojis and hashtags to highlight the topic of your content. More than two-thirds of consumers trust the word of friends, family, and even strangers over any marketing content from a brand. This is because people are more likely to act when they see others have done so. Whether it’s reading a post or making a purchase, people prefer to follow in the footsteps of others like them. Social proof is becoming more important as consumers’ access to online-based data and information about companies grows. Humans are creatures of habit, so people’s expectations are shaped by past experiences. We select what we pay attention to, infer how it works based on experience, and combine current circumstances with past knowledge to interpret what to do. For marketers, keep in mind when creating content how the mind perceives situations. While it can be tempting to try something new and be off the wall, going too far beyond a prospect’s expectations may be off-putting. People have come to expect some sort of CTA in company content. If they reach the end of your content and want to continue engaging but aren’t guided to the next step, they’ll be confused. Motivation and ability are two major psychological influences for buyers and are key to creating effective content. To motivate people, your content needs to contain strong, relevant messages. The messages also need to be easily understood. But you also need a trigger if you want prospects to carry out an action. – include a CTA to encourage an action. Recent studies suggest that people judge a new product within 90 seconds of seeing it and most of their assessment is based on color. Color is an important consideration for content marketers when designing web pages, choosing banner images, and planning videos. – red, orange and yellow in CTA buttons foster a sense of urgency. In the beginning, applying these concepts to your projects will take time and consideration. But before you know it, these principles will become a natural part of your content planning. Chances are you already used at least one of these principles in your content marketing without even being aware.